Errol: Well, to be fair, I did work on some Totoro Knitting and some comicize perks. 😀 I also played a lot of games. If I did, you’d explode. How do I procrastinate? Easy. 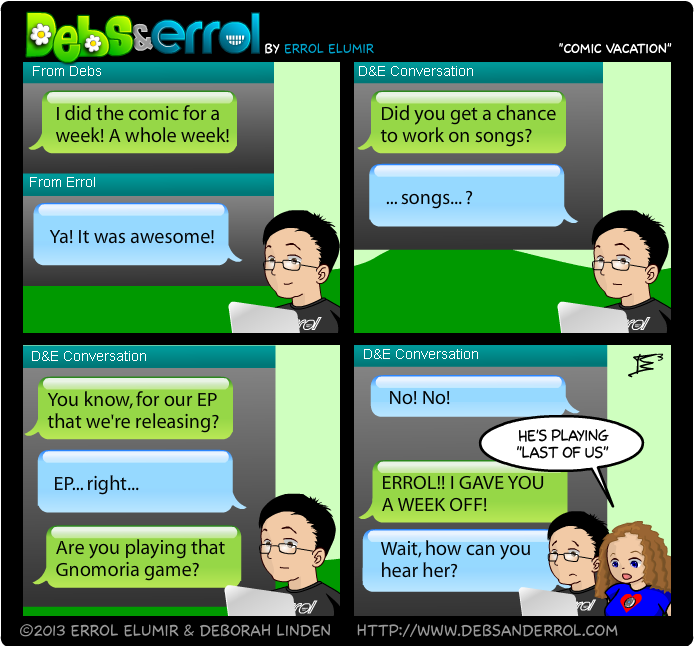 Please see Errol’s “Please Leave Me Alone” song for a general idea. Oddly Yahoo RP helps me focus on computer work. Gaia, Warcrack, and virtually anything else I do on line…. helps me procrastinate. I barely escaped Tumblr with my life. Jez…. KH 1.5 Final mix. October. PS3. KILL ME NOW! Wait you own a PS3? No one owns a PS3! Wow, you’re the first person that I know of who has a PS3! The answer to your question is Twitter. I generally fall on both sides of the spectrum. When I’m taking classes or have a big project (like making maille pretties), I’m all over obsessive in the make-lists-of-every-minute-task and put-in-12-hour-days-forgetting-to-eat. But when I have time off, I have a devil of a time to even motivate myself to stop playing iphone games. It’s sad. When I took my last final for the semester, I had all these plans about finally having time to get some random stuff done. Almost 2 months in, and….I’ve made a character for a Dresden roleplay that might never happen… I’ve also read almost the entire season eight of the Buffy the Vampire Slayer comics.